This study investigates the possible characteristic Computed Tomography (CT) and Magnetic Resonance Imaging (MRI) findings of parapharyngeal Pleomorphic Adenoma (PA), which is rarely found, reported. We analysed 6 cases that had been diagnosed with nasopharyngeal PA and surgically treated in the last 6 y with both the symptoms of the patients and the characteristics of the tumours. The most frequent symptom was symptom free (4 patients). All the patients had the clinical sign of oropharyngeal mass, which is painless and hard. Three of 6 patients underwent CT plain scan. Five patients underwent CT contrast scan. Only one patient underwent MR plain scan and contrast scan. There are some special imaging findings about this disease: The special pre-styloid location (the prestyloid fat pad is displaced laterally, the carotid artery and the jugular vein are pushed away posteriorly or not displaced, and the styloid process was displaced posteriorly or partly encased by the mass); Locally expanded or lightly invasive growing development; Complicated CT density/MR signal intensity; and the oppressive bone absorption of the posterior part of the maxillary. Although the nasopharyngeal PA is rarely reported, it has some characteristic radiologic findings. The suggestive radiologic methods are MR plain scan, MR contrast scan and CT plain scan to observe the extent, signal, and involvement of the tumour. Pleomorphic adenoma, Nasopharyngeal, Computed tomography, X-ray, Magnetic resonance, Imaging analysis. Pleomorphic Adenoma (PA), or benign mixed tumour, is the common benign tumour of both the minor salivary glands and the major salivary glands. It makes up around 65% of all salivary gland tumours. And it is the most common type of tumours of the minor salivary glands . Minor salivary glands include all salivary glands except the three major salivary glands: the parotid gland, the submandibular gland and the sublingual gland. The numerous minor salivary glands located in the sub mucosa of the aero digestive tracts. If the tumour occurs in the minor salivary glands, it can occur in many sites, such as soft palate, hard palate, nasopharynx, orbit, trachea, buccal mucosa, cheek, nasal septum, upper lip, lower eye lid, and external auditory . Pleomorphic adenoma of the minor salivary glands are often detected at the patient’s 40~60 y in health examination or by accident, because the patients are asymptomatic . The other symptoms of nasopharyngeal PA are related to its localization, they include foreign body sensation, dysphagia, hearing loss, hoarseness. Female predominated slightly . The nasopharyngeal PA is extremely rare [2,3]. As a result, there are few reports about the imaging findings of this tumour. Nasopharyngeal PA discussed in this article referred to those arising from the extra parotid minor salivary gland in the prestyloid fat or aberrant salivary tissue within a lymph, which should be differentiated from those arising from the deep portion of the parotid gland and other tumours locating in the parapharyngeal space, such as nasopharyngeal carcinoma, schwannoma, paraganglioma, lymphoma, etc.[4-8]. 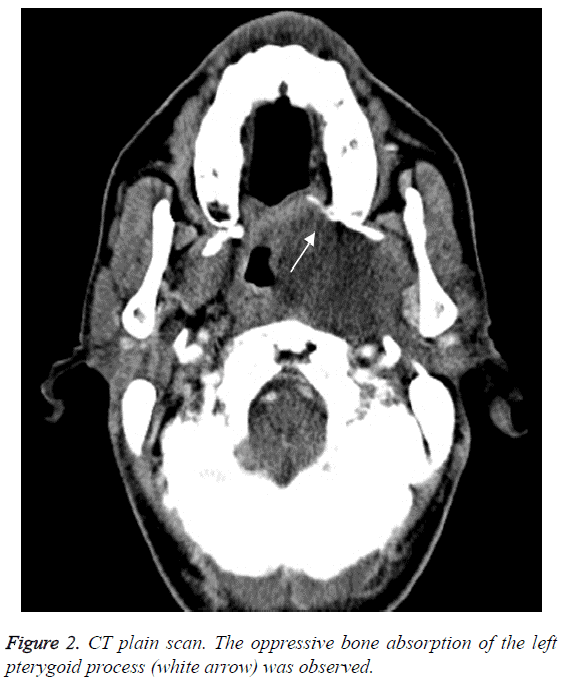 It is really a challenge for the radiologist to diagnose the nasopharyngeal PA before the operation because of the nonspecific symptoms and computed tomography (CT)/magnetic resonance (MR) findings. This study included six patients who had been diagnosed with nasopharyngeal PA and had CT/MR images in our hospital in the last 6 y. All patients have been surgically treated. We traced the CT/MR image findings combined with the histopathologic component of this tumour to see if the nasopharyngeal PA has some special CT/MR findings helping the radiologist to draw a conclusion. This retrospective study included patients who had been diagnosed pathologically with parapharyngeal PA and surgically treated in the last 6 y in our hospital. This study involved 6 patients (3 men and 3 women, age range 48-68 y, mean 55.83 y). All patients were clinically evaluated in detail before operation. All procedures performed in studies involving human participants were in accordance with the ethical standards of the institutional and national research committee and with the 1964 Helsinki declaration and its later amendments or comparable ethical standards. Informed consent was obtained from all individual participants included in the study. CT images were obtained in all 6 patients. A 64-slice CT (Siemens, Germany) was used in all patients, and transverse CT images were reconstructed with 2.5 mm or 5 mm section thickness and no overlap. Not all patients underwent both CT plain scan and contrast scan. Three patients underwent CT plain scan. Five patients underwent CT contrast scan. CT contrast scan were obtained 45 s after initiating IV bolus injection of 50 ml of non-ionic iodine contrast material containing 300-320 mg iodine per ml at an injection rate of 3 ml/s. Only one patient underwent MR plain scan and contrast scan. The patient was examined using a 3.0-TMR imaging system (signa3.0, GE Healthcare, Milwaukee, WI, USA). MR images were obtained in the transverse plane at a section thickness of 5 mm with a 1 mm intersection gap. T1-weighted spin-echo (repetition time (TR)/echo time (TE), 780/8 ms; imaging matrices, 512 × 512; field of view, 200 × 200 mm) and fat saturated T2-weighted fast spin-echo (TR/TE, 3160/100 ms; imaging matrices, 512 × 512; field of view, 200 × 200 mm) images were obtained. Gadolinium-enhanced fat saturated T1- weighted spin-echo images (TR/TE, 1000/13 ms) were obtained after the intravenous injection of 0.1 mmol/kg of gadopentetate dimeglumine (Magnevist, Schering, Berlin, Germany). The medical records, which included symptoms, clinical signs, radiologic findings and histopathological findings, were evaluated and analysed. Radiologic findings assessed on CT imaging’s included density on CT plain scan and contrast scan, the fat pad around the mass, the posteriorly displaced carotid artery and jugular vein, oppressive bone absorption of the maxillary, the shape, the relation to the styloid process and the parotid. And MR signal intensity and those findings above were discussed on MR imaging. Because the study sample was too small, no statistical analyses were performed. Numbers were used to describe the frequency of certain finding in this study. This was a retrospective analysis of parapharyngeal PA of 6 patients (3 males; 3 females) treated by surgery, whose mean age was 55.83 y (range 48-68 y). The symptom and clinical manifestation was showed on Table 1. The most frequent symptom was symptom free (4 patients). There was one patient who suffered from snoring for half of a year, and another patient who had dysphagia and hearing loss for 3 months. All the patients have the clinical sign of oropharyngeal mass, which is painless and hard. One patient has a bulge at pro-antilobium and para-lobule, another at the submandibular region, the four patients left showed no cervical mass. The dimensions of the mass are usually large, the min dimension is at least 1.6 cm, and the max dimension is as long as 8 cm. Table 1: Incidence of symptoms. CT imaging findings of this series of patients are summarized in Table 2. 3 of 6 patients underwent CT plain scan. One had homogeneous density on CT plain scan, the other two had inhomogeneous density. Five patients underwent CT contrast scan. All of 5 patients had inhomogeneous density on CT contrast scan. Three cases (50%) didn’t show clear fat pad around the mass, three cases (50%) show clear fat pad medially and laterally, while the fat pad between the tumour and the anterior pterygoid muscle or lingual radix were unclear (Figure 1). Whether the fat pad was clear or not was not in accord with whether the capsule was intact surgically. Four cases (66.67%) showed the posteriorly displaced carotid artery and jugular vein, and two cases (33.33%) showed the carotid artery and jugular vein not displaced behind the mass. The oppressive bone absorption of the posterior part of maxillary was observed in all 6 cases (Figure 2). Two masses (33.33%) located apart from the parotid, and the other four (66.67%) masses located near to the parotid. However, the fat layers between the mass and the parotid were not clear. The styloid process was partly encased by the mass in 3 cases (50%), was displaced posteriorly in one patient (16.67%), was both partly encased and displaced laterally in one patient (16.67%), and was neither partly encased nor displaced posteriorly in one patient (16.67%). All of the masses of this study were oval or slightly lobulated, and we find no mass with “dumbbell” shape. Table 2: CT imaging findings. Figure 1: CT Plain Scan (A) and Contrast Scan (B) of Case 3. The density of the mass on both CT Plain Scan and Contrast Scan are inhomogeneous. Some area of low density on the CT Plain Scan are not enhanced (diamond, Area 2), others are mildly enhanced (triangle, Area 3), and the high density of the CT Plain Scan are apparently enhanced (star, Area 1). A fat-plane around the mass could be seen (arrow), however, it is not clear between the mass and the lateral pterygoid muscle (dot line). The oppressive bone absorption of the posterior part of the near maxillary is also seen (circle). Figure 2: CT plain scan. The oppressive bone absorption of the left pterygoid process (white arrow) was observed. Only one patient underwent MR plain scan and contrast scan. On T1 weighted imaging (T1WI), some part of the fat layer around the mass which was not clear on CT image was apparently high signal intensity in the T1WI (Figure 3). Figure 3: MR imaging of Case 1. A. Coronal fat suppressed T2WI, B. Coronal T1WI, C. Coronal fat suppressed T1WI contrast scan. Areas showing low signal intensity on both T1WI and fat suppressed T2WI, was apparently enhanced after administration of gadolinium (white arrow, Area 1), while other areas showing mild high signal intensity on both T1WI and fat suppressed T2WI, was not enhanced (white arrowhead, Area 2), and areas of low signal intensity on T1WI and slightly high signal on fat suppressed T2WI, was mildly enhanced after administration of gadolinium (white curved arrow, Area 3). The MR imaging of Case 1 (Figure 3) showed some other interesting points as described in Table 3. The mass is a quasicircular area of inhomogeneous signal attach to the right wall of nasopharynx. Some areas (Area 1) of it showing low signal intensity on both T1WI and fat suppressed T2 weighted imaging (T2WI), was apparently enhanced after administration of gadolinium, while other areas (Area 2) showing mild high signal intensity on both T1WI and apparently high signal intensity on fat suppressed T2WI, was not enhanced, and still other areas (Area 3) showing low signal intensity on T1WI and slightly high signal intensity on fat suppressed T2WI, was slightly in homogeneously enhanced after administration of gadolinium. What may the complicated imaging findings mean? We will discuss next. Table 3: Complicated CT destiny, MR signal intensity and possible related histopathologic composition of PA.
All patients were diagnosed pathologically, the typical pathologic finding is the admixture of both epithelium and mucus chondroid matrix (Figure 4). Figure 4: The pathological section of Case 1, the same patient as Figure 3. The typical pathologic finding is the admixture of both epithelium and mucus chondroid matrix. Glandular epithelial cell is cubic, arranging in a tube or diffusely, with conglobing or diffusing myo-epithelial cell around the tubes and the eosinophilic mucus in the tubes. Haematoxylin-eosin staining; original magnification 100. Nasopharyngeal PA is rarely reported. It’s difficult for the radiologist to diagnosis this disease before the operation for the complicated findings and kinds of differential diagnosis. The purpose of this study was to evaluate the symptoms and clinical signs and to analyse the image findings. Kuo’s 10-year experience of extra-major salivary gland pleomorphic adenoma of the head and neck shows only one case of nasopharyngeal pleomorphic adenoma among all the 37 cases of pleomorphic adenoma of the minor salivary glands . Hughes et al. found 68 PA from 172 parapharyngeal space tumours, because the cases included PA originated from both parotid gland and the micro salivary gland in the parapharyngeal space . The articles about nasopharyngeal pleomorphic adenoma were mostly isolated case reports, among which there were only 4 cases with some radiologic images [10-13]. This series of nasopharyngeal pleomorphic adenoma was not only confirmed by surgical pathology, but also examined with comprehensive radiologic images, i.e. CT plain scan and enhancement scan, MR plain scan and enhancement scan, although not all the examine methods were used on every patient. The clinical symptoms and radiologic findings about the nasopharyngeal pleomorphic adenoma will be discussed next. The symptoms of the parapharyngeal PA reported in literature are: growth on the neck, pain, dysphagia, pharyngeal growth, otalgia, ear stuffy, hearing loss and some special symptom as a result of the involved cranial nerves, and also includes being asymptomatic [8,14-16]. Different studies reported different frequencies of the symptoms. In this series of patients, four cases showed no typical clinical symptoms, which could explain why the nasopharyngeal pleomorphic adenoma can grow large without being noticed [8,17]. Besides, there were one patient had dysphagia and hearing loss and another patient suffered from snoring for half a year. The study sample was too small to discuss the frequency of the symptom. Location: The nasopharyngeal PA usually locates in the prestyloid part of the para-pharyngeal space. There are several common points about the imaging findings of the special location. First, the pre-styloid fat pad is displaced laterally, and in some cases a fat-plane between the mass and the deep lobe of the parotid could be seen . However, if the diameter of the tumor is too large, the fat plane is too thin to be detected . As a result, fat plane is not a necessary but a significant imaging finding. In this study, four cases (66.67%) didn’t show clear fat pad around the mass including the area between the mass and the deep lobe of the parotid, two cases (33.33%) show clear fat pad laterally and medially, but the fat pad is not clear anteriorly between the mass and the medial and lateral pterygoid muscle or lingual radix. The possible reason is some sites had more space for the fat plane to be not too thin. Second, the carotid artery and the jugular vein are pushed away posteriorly or not displaced, which contributes to the diagnosis of thepre-styloid masses . On the contrary, if the carotid artery and the jugular vein were displaced anteriorly, other possible origin (for an example, neurogenic tumor) should be considered. Third, the styloid process was displaced posteriorly or partly encased by the mass. Muraz et al. find the styloid process was displaced posteriorly in 3 tumors (n=9) . In this series of patients, we found not only the same finding asMuraz, but also the finding of partly encased styloid process, which is not described before. The possible reason is the location of the former was not near to the styloid process enough and the size of it was not large enough, yet the size of this series was large enough. Large sample study is needed to see if this finding is specific about this disease. Edge and shape: The nasopharyngeal PA is reported as a welldefined spherical or slightly lobulated homogeneous mass [8,17]. The edge and shape of the tumour make some senses for the diagnosis. The tumour may be locally expanded or lightly invasive. When it’s locally bulgy, it often has clear capsule, yet when it’s invasive, it usually has irregular shape with unclear capsule and involvement of the adjacent structure, such as the sinus cavernosus. However, the capsule showed on the image is not always in accordance with the histopathologic findings, that is, the unclear capsule didn't always mean the capsule is involved. Also, the relationship of the mass and the parotid could indicate its origin. The “dumbbell” mass, with a part of which in the parotid, or most of the mass locates in the parotid, suggests the possible origination from the deep lobe of the parotid [21,22]. In this study, the mass located far from the parotid or press the parotid slightly making the pressed edge of the parotid shallow concave, which didn’t support the origination of the deep lobe of the parotid, at the same time, the pathologic findings after operation confirmed the imaging diagnosis. The oppressive bone absorption of the pterygoid process: There is a characteristic finding which has not been mentioned in the literatures before: the oppressive bone absorption of its near bone is often observed because of the slow development of the tumour. The foci of the series of cases are big enough to oppress the pterygoid process with the oppressive bone absorption, which reflects the benign biological behaviour of PA. Be attention to the differentiation of the insect-erosion bone destruction caused by malignant tumour and the oppressive bone absorption. The insect-erosion bone destruction could be observed on CT bone window, and the existence of the marrow edema could be confirmed on MR fat suppressed T2WI. If the bone destruction accompanies the marrow edema, it is more likely malignant. Consequently, CT plain scan is useful to display the change of the near bone, and the MR plain scan is good at showing the bone destruction with marrow edema. Inhomogeneous CT density/MR signal intensity: The complicated cell morphology of pleomorphic adenoma results in its inhomogeneous CT density or MR signals . The typical pathologic findings of this disease include multiple tissue constitution: both epithelium and mucus chondroid matrix. Glandular epithelial cell is cubic, arranging in a tube or diffusely, with conglobing or diffusing myo-epithelial cell around the tubes and the eosinophilic mucus in the tubes. Also, other components, such as ossification, calcification, fat and haemorrhage are included. No mitotic, necrosis or malignant metastasis is found in the tumour . Although there was only one patient who took the MR plain scan and post-contrast scan, there were some characteristic imaging findings according with the histopathology of the tumour. The analysis of radiologic findings of the tumour and its possible histopathologic components are displayed in Table 3. It is reported that the tumour was homogeneously hypo attenuating on CT plain scan and was heterogeneous on CT enhancement . In this series of study, according to the Table 3, the tumour density of Case 4 was homogeneous on CT plain scan, and was in homogeneous on CT contrast scan. Other two cases who took both CT plain scan and CT contrast scan, showed heterogeneous on both images. Finally, another two cases who only took CT contrast scan showed heterogeneous density. Some MR findings are not accordance with the literature reported before. It is reported that the areas containing abundant fibromyxoid stroma show hyper intensity on T2WI with marked enhancement, and the areas of high cellularity show isointensity or slight hypo intensity on T2- weighted images with slight enhancement [8,23,25]. Most studies didn’t describe the characteristics of the MR signal intensity in detail [10-13]. In this study, the signal intensity of both MR plain scan and post-contract MR scan were heterogeneous. The areas of low signal on both T1WI and fat supressed T2WI, which were well enhanced, are considered to be the solid part, while the areas of a slightly high signal on T1WI and apparently high signal on fat suppressed T2WI which were not enhanced, are considered to be the mucus chondroid matrix rather than necrosis. This opinion would be supported by the following two points. On the one hand, the signal characteristic is different from that of the necrosis, which is low-T1-signal and high-T2-signal; on the other hand, the possibility of necrosis is relatively low and the pathologic findings showed no necrosis. Moreover, there was another kind of area, which was low signal on T1WI, high signal on T2WI and slightly enhanced on post-contrast MR scan. What on earth do this area means? Perhaps some more complicated components? The MR findings are different from the literature. The possible reason is the different proportion of the compositions. Maybe these findings could contribute to the diagnosis of PA as a characteristic radiologic finding corresponding to the histology of mixed heterogeneous components. The density of CT contrast scan was heterogeneous too. The enhanced areas on CT post-contrast scan were slightly high density on CT plain scan, and the unenhanced areas were low density. In brief, pleomorphic adenoma may be homogeneous or inhomogeneous on CT plain scan, however, it should be inhomogeneous on MR plain scan and on CT/MR contrast scan. Therefore, MR plain and contrast scan are suggested to indicate the complicated component of the tumour. The differential diagnosis should include nasopharyngeal carcinoma, schwannoma, carotid body paraganglioma, lymphoma, epidermoid cyst, cavernous hemangioma, etc. Clinical manifestation and imaging findings should be comprehensively considered to give an appropriate diagnosis. The typical location may be useful to distinguish PA from several diseases. In case of nasopharyngeal carcinoma, the mucosa of the pharyngeal is usually involved at the early stage, while in the case of nasopharyngeal PA that is always normal . Schwannoma often locates at the carotid space and the post-styloid space, while the nasopharyngeal PA usually locates at the pre-styloid space . The former usually originates from the vagus nerve and accessory nerve, and seldom make the carotid artery compressed. The latter usually originates from the hypoglossal nerve, and often makes the carotid artery compressed anteriorly and laterally. The reason is that the vagus nerve and accessory nerve are incased in the carotid sheath as the carotid artery, while the hypoglossal nerve lines behind the carotid sheath. Carotid body paraganglioma often locates in the bifurcation of the carotid artery and make the internal carotid and the external carotid artery disported . Nasopharyngeal malignant lymphoma is often symmetrical and diffuse exophytic tumour that can extend into the nasopharyngeal airway rather than infiltrating deeply into the parapharyngeal region . It usually encases the blood vessel, but rarely invades the bone. The CT density/MR signal intensity is another key differential point. Both nasopharyngeal carcinoma and nasopharyngeal malignant lymphoma present intermediate signal intensities on T1WI, slightly increased hyper-intensity signals on T2WI, and a mild or moderate enhancement is present following administration of contrast medium, which is different from PA . The signal of the carotid body paraganglioma is heterogeneous like "salt and pepper", and is apparently enhanced on CT/MR contrast scan because of its affluent blood supply . Only Schwannoma’s signal intensity is heterogeneous on both MR plain scan and contrast scan, however, its location is different from PA's . Actually, it is difficult to differentiate every suspected disease from the nasopharyngeal PA, and we need large population to testify the specificity of the findings mentioned in this article. There are several limits of this study. The sample is too small because the disease is really rare. The limited sample limited the analysis of the image findings. Moreover, not all the patients undergone CT and MR plain scan and contrast scan. So it was difficult to identify the typical image findings of nasopharyngeal PA.
Consequently, the possible radiologic findings of nasopharyngeal PA include: 1. Pre-styloid soft tissue mass in the posterior top wall of the nasopharynx, because of the oppression of the mass, the pre-styloid fat pad is displaced laterally, the carotid artery and the jugular vein are pushed away posteriorly or not displaced, and the styloid process was displaced posteriorly or partly encased by the mass. 2. The tumour may be locally expanded or lightly invasive. If the capsule is interrupted or unapparent, the tumour tends to be more invasive. However, if the capsule of the tumour is clear or not is not always accordance with the histopathologic findings. 3. Complicated density and signal intensity, MR is good at displaying the heterogeneous composition, CT is used to show the haemorrhage and the calcification of the mass. 4. If the tumour is big enough, the oppressive bone absorption of pterygoid process can be observed, with the bone edge sclerosis. Furthermore, there are some suggestions about imaging examination: first, the scope of the tumour should be determined on MR plain scan and contrast scan; second, CT plain scan is good at showing the extent of oppressive bone absorption; third, MR fat suppressed T2WI is used to exclude the existence of the marrow edema. The therapeutic strategy of the nasopharyngeal PA is complete surgical operation, which depends upon the radiologic diagnosis and the size, location and extension of the mass described by the images . Therefore, radiologic diagnosis is very important. It has been reported that nasopharyngeal carcinoma existed in the pleomorphic adenoma [23,29]. As a result, radiological assessments are very useful in both evaluating tumour before operation and following recurrence post operation. The oppressive bone absorption of pterygoid process and the complicate MR signal intensity are possible characteristic radiologic findings which have not be mentioned before about the nasopharyngeal PA. The suggestive radiologic method is MR plain scan, MR contrast scan and CT plain scan. Comprehensive imaging exams are the precondition of the radiologic diagnosis and differentiation diagnosis, and are the foundation to make the most appropriate therapeutic strategy. Waldron CA, el-Mofty SK, Gnepp DR. Tumors of the intraoral minor salivary glands: a demographic and histologic study of 426 cases. Oral Surg Oral Med Oral Pathol 1998; 66: 323-333. Kuo YL, Tu TY, Chang CF, Li WY, Chang SY, Shiao AS, Chu PY, Chan KT, Tai SK, Wang YF, Kao SC, Kao SY, Lo WL, Wu CH, Shu WH, Ma S, Wang TH. Extra-major salivary gland pleomorphic adenoma of the head and neck: a 10-year experience and review of the literature. Eur Arch Otorhinolaryngol 2011; 268: 1035-1040. Stuteville OH, Corley RD. Surgical management of tumors of intraoral minor salivary glands. Cancer 1967; 20: 1578-1586. Hakeem AH, Hazarika B, Pradhan SA, Kannan R. Primary Pleomorphic adenoma of minor salivary gland in the parapharyngeal space. World J Surg Oncol 2009; 7: 85. Batsakis J, Sneige N. Parapharyngeal and retropharyngeal space diseases. Ann Otol Rhinol Laryngol 1989; 98: 320-321. Carrau R, Myers E, Johnson J. Management of tumors arising in the para-pharyngeal space. Laryngoscope 1990; 100: 583-589. Khafif A, Segev Y, Kaplan DM, Gil Z, Fliss DM. Surgical management of parapharyngeal space tumors: a 10-year review. Otolaryngol. Head Neck Surg 2005; 132: 401-406. Dimitrijevic MV, Jesic SD, Mikic AA, Arsovic NA, Tomanovic NR. Parapharyngeal space tumors: 61 case reviews. Int J Oral Maxillofac Surg 2010; 39: 983-989. Hughes KV, Olsen KD, McCaffrey TV. Parapharyngeal space neoplasms. Head Neck 1995; 17: 124-130. Tsunoda A, Takahashi M, Kishimoto S, Suzuki M. Nasopharyngeal pleomorphic adenoma presenting as otitis media with effusion: case report and literature review. Am J Otolaryngol 2014; 35: 73-76. Berrettini S, Fortunato S, De Vito A, Bruschini L. A rare case of nasopharyngeal pleomorphic adenoma. Case Rep Otolaryngol 2013; 712873. Daroszewski M, Burduk PK, Marszałek A. Endoscopic surgery for Warthin's tumor of the nasopharynx. Otolaryngol Pol 2012; 66: 232-235. Martinez-CG, Martin-MC, Espinosa-RF. Transnasal endoscopic resection of a nasopharyngeal pleomorphic adenoma: a rare case report. Eur Arch Otorhinolaryngol 2012; 269: 2009-2013. Santoro R, De MW, Coscarelli S, Polli G. Multiple neurinomas of the parapharyngeal space. Eur Arch Otorhinolaryngol 1997; 254: 301-303. Cohen SM, Burkey BB, Netterville JL. Surgical management of parapharyngeal space masses. Head Neck 2005; 27: 669-675. Chijiwa H, Mihoki T, Shin B, Sakamoto K, Umeno H, Nakashima T. Clinical study of parapharyngeal space tumours. J Laryngol Otol Suppl 2009; 31: 100-103. Allison RS, Van der Waal I, Snow GB. Parapharyngeal tumours: a review of 23 cases. Clin Otolaryngol Allied Sci 1989; 14: 199-203. Shirakura S, Tsunoda A, Akita K, Sumi T, Suzuki M, Sugimoto T, Kishimoto S. Parapharyngeal space tumors: anatomical and image analysis findings. Auris Nasus Larynx 2010; 37: 621-625. Som PM, Sacher M, Stollman AL, Biller HF, Lawson W. Common tumors of the parapharyngeal space: refined imaging diagnosis. Radiol 1988; 169: 81-85. Muraz E, Delemazure AS, Mourrain-LE, Bourget K, Malard O, Frampas E. Peripharyngeal space tumors: Can magnetic resonance and multidetector-row computed tomography help predict location, malignancy and tumor type? Diagn Interv Imaging 2016; 97: 617-625. Iglesias-Moreno MC, Lopez-Salcedo MA, Gomez-Serrano M, Gimeno-Hernandez J, Poch-BJ. Parapharyngeal space tumors: Fifty-one cases managed in a single tertiary care center. Acta Otolaryngol 2016; 136: 298-303. Kato H, Kanematsu M, Mizuta K, Aoki M. Imaging findings of parapharyngeal space pleomorphic adenoma in comparison with parotid gland pleomorphic adenoma. Jpn J Radiol 2013; 31: 724-730. Kato H, Kanematsu M, Mizuta K, Ito Y, Hirose Y. Carcinoma ex pleomorphic adenoma of the parotid gland: radiologic-pathologic correlation with MR imaging including diffusion weighted imaging. AJNR Am J Neuroradiol 2008; 29: 865-867. Rosai J, Ackerman LV. Gastrointestinal tract-large bowel. J Ackerman’s Surg Pathol 2011; 762-768. Okahara M, Kiyosue H, Hori Y, Matsumoto A, Mori H, Yokoyama S. Parotid tumors: MR imaging with pathological correlation. Eur Radiol 2003; 13: 25-33. Liu XW, Xie CM, Mo YX, Zhang R, Li H, Huang ZL, Geng ZJ, Zheng L, Lv YC, Wu PH. Magnetic resonance imaging features of nasopharyngeal carcinoma and nasopharyngeal non-Hodgkin's lymphoma: are there differences? Eur J Radiol 2012; 81: 1146-1154. Aksoy F, Yenigun A, Senturk E, Ozturan O. Schwannoma Located in Nasopharyngeal Region. Case Rep Otolaryngol 2016; 2016: 8260629. Brink I, Hoegerle S, Klisch J, Bley TA. Imaging of pheochromocytoma and paraganglioma. Fam Cancer 2005; 4: 61-68. Kariya S, Kosaka M, Orita Y. Adenocarcinoma ex pleomorphic adenoma of the head and neck: report of five cases. Auris Nasus Larynx 2006; 33: 43-46.